I had been a member of Fitness First (FF) for over 3.5 years before in 2 FF clubs. And now that I have not been working out for the longest time, my body seeks a regular workout in the gym again. I am fully aware how important it is to maintain a good physique, be healthy and fit all the time. I wish I could be in good shape again. This week, Fitness First celebrates International Fitness Week and offers fitness enthusiasts for a free workout during the 1-week only limited period. Isn't that amazing? As evidenced by the sudden growth of running communities and dance classes, increase in demand of healthy food and beverages and sudden spurt of healthy restaurants around the metro, health and fitness has indeed become integral in the Filipino lifestyle. To further create awareness on the importance of Fitness with the aim of creating a healthier nation, the world’s number one fitness chain, Fitness First, is set to roll out a week-long campaign in support of International Fitness Week scheduled on February 1-7, 2010.
International Fitness Week is the first ever awareness campaign backed by Fitness First to improve the health of the nation by offering members and non-members the chance to try something new for free and generate local networks with the involvement of local schools, colleges and offices nationwide. With over 400 gyms across 15 countries participating in the campaign, Fitness First pioneers bringing the campaign to the Philippines. “We are proud to celebrate International Fitness Week this year. It’s amazing to see more and more Filipinos embracing a healthy, balanced lifestyle,” said Mark Ellis, Fitness First Country General Manager. Taking the lead for International Fitness Week 2010 as the global ambassador for the campaign is former Spice Girl Mel B., who has become an international fitness advocate with a top selling work-out DVD tucked under her belt. From February 1 to 7, all clubs of Fitness First around the world are opening their doors and offering everybody the opportunity to experience working out for FREE and try something new in a bid to make the world a fitter place. On top of building awareness on the importance of fitness through International Fitness Week, Fitness First has partnered with Gawad Kalinga to help the organization raise funds for its humanitarian efforts. 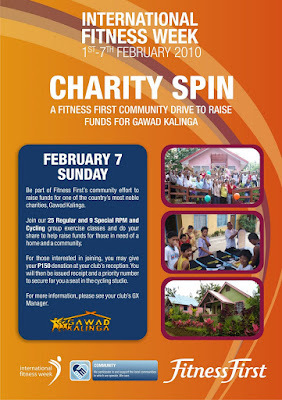 With Fitness First’s Charity Spin on February 7, 2010 every participation fee of Php 150 will go directly to Gawad Kalinga. The donation of 150 pesos entitles participants to nine (9) special RPM and cycling group exercise classes. The nine special RPM and cycling classes are offered in the following Fitness First clubs: MOA, SM Southmall, Robinsons Summit Center, Trinoma, Ortigas, North Edsa, Pampanga, Megamall and Cebu. 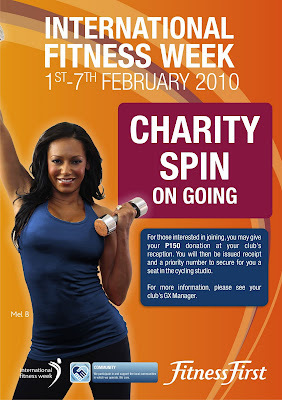 Donations and registration for classes are facilitated at the receptions of all Fitness First Clubs. Take the Fitness Assessment. This includes a blood pressure check, height, weight and body composition analysis. The objective is to identify precisely how to improve your health and wellbeing, adding valuable focus to any exercise routine. Ever wondered how to strengthen yourself from the inside? Building a strong ‘core’ is the key to maintaining great posture and reducing unwanted back pain. Join us for a 10-minute Core Workout. Join our in-house Nutritionist in a discussion on prevention of cardiovascular diseases through dietary modification. Learn more about taking care of your heart this February as we celebrate National Heart Month. Do you know how much endurance you actually have? Take the Talk Test and find out just how much stress from your daily activities affects your health. Join us for a 10-minute Treadmill Workout. Many of us spend our working lives behind a desk, or inactive for long periods during the day which can take their toll on your posture. Get a Postural Analysis and learn simple ways to stand tall and feel stronger. Working out as a family can make fitness fun and achievable for everyone. Bring the family to a club near you to get active together! Each family member is instructed by a personal trainer for customized training advice. Working out with a friend increases motivation and makes exercise much more fun. Join our Group Exercise Classes together and dance, punch and grind your calories away. Visit the official International Fitness Week website www.internationalfitnessweek.com to download a 7-Day Free Guest Pass and learn more about the daily activities. Fitness First is the #1 global fitness company and the world’s largest fitness operator with 18 clubs now just in the Philippines. For inquiries, call (632) 848.0000 or visit www.fitnessfirst.com.ph. I think that the international fitness week is such a smart idea to join everyone who wants to get in shape. I guess there should also be a viagra online week for those with any kind of erectile dysfunction.